With many phones looking like clones, or brands nonchalantly pushing out the same old design year-on-year, Samsung is in that favourable position of offering something exciting in the Galaxy S8. It's a phone that defines flagship design with its visually arresting dual curved edges. Its innards epitomise flagship specification. And its 18.5:9 ratio screen aims its sights at delivering best-in-class entertainment. 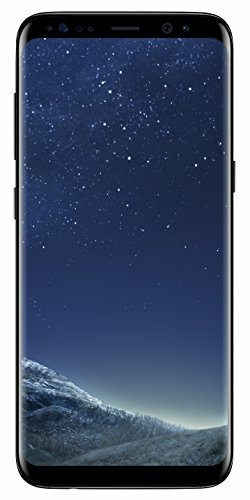 But the S8 is quite a departure for Samsung: it moves the fingerprint scanner from the once staple physical home key position on the front - which has been removed to make way for that unconventional screen - to the rear of the device, launches with a quick-access Bixby button but minus the voice-controlled assistant being properly functional, and costs a small fortune too. Do these points get in the way of what otherwise looks like the perfect flagship Android phone? Samsung has opted for "Unbox your phone" as the slogan for S8 promo and, well, it's hardly a catchy line. However, upon unboxing the S8 it's immediately eye-catching - even before switching it on - given its shape, shine and meticulous finish. This is as good-looking as phones get. A key reason for that are those curved edges, which appear high-end and give the phone a greater sense of depth, plus added comfort when holding. This is a show-off phone, that's for sure. The S8 might have a similar screen ratio to the LG G6, but Samsung delivers an altogether more integrated design in our view, as if you are holding the screen and almost nothing besides. As we touched upon, the S8's screen-centric design means there's no longer a physical home button, as there has been in Galaxy S devices for years. That's a big change for long-term Samsung users: unlocking the device now means reaching around to the rear to locate a slither of fingerprint scanner… a slither that's been placed too high up the phone's rear and foolishly to the side of the camera, so you'll all too often smear that with some fingertip marks. Even after a week of use, we've rarely used the fingerprint scanner to unlock the device, as its response is weak - maybe 70 per cent success rate, compared to 99 per cent of the older Galaxy devices - instead opting only for finance and banking apps as its method of use. Muscle memory might help, but it needs a positional rethink for the S9. But moving that fingerprint scanner away from front and centre is a big part of how Samsung has made a phone that's dominated by the screen itself, not surrounding bezels and buttons. A trio of Android soft keys - current apps, home and back (in that order, left-to-right, not "backwards" as per previous Samsung devices) - sit on the screen, ready to be hidden away when content demands it, for an all-encompassing view. And it looks brilliant. The S8 isn't bereft of buttons, though, with a lone power key to the right-hand side, with volume up/down and a dedicated Bixby button featuring on the opposite edge. Given the placement of this Bixby button - which, at the time of writing, is a pointless addition, as it doesn't do anything and isn't programmable - we've often picked the phone up back-to-front, that's how reversible those dual curved edges and black-out AMOLED screen make the phone seem when handling it blindly. Display wise there's one point to clear out of the way: the Galaxy S8 has a bigger brother, the S8+, which is a larger-screen version (with a slightly more capacious battery to match). As that all-important plus symbol in the name suggests, its purpose in life is to go large, expanding upon the S8's 5.8-inch screen with a massive-sounding (but surprisingly manageable) 6.2-inch panel. Otherwise the experience between both S8 devices in one and the same: the same spec, same resolution, same software, same hardware features. It's merely a choice in size, without really complicating things further. In the S8 that actually means you get the more pixel-packed display than the Plus, as the same number of organic LEDs are spread over a slightly smaller surface area. There's a whole heap of them, too, with the WQHD+ resolution equating to 4.2-million of the blighters (for perspective, that's about half of a 4K TV panel in the palm of your hand). Interestingly, these pixels aren't always used without activating a Performance Mode to save on battery. But when they are, and with the right content, the S8's display looks simply fantastic. It's not quite perfect, though. That dual edge design is definitely eye-catching, but it also brings a slight issue to colour towards the edges. Where the glass curves, so too does the presentation of colour, with an aberration of purple-green mildly visible if you're really looking for it. Such edges can sometimes make handling far-edge icons on screen a little trickier to interact with, too. The other big point is the 18.5:9 aspect ratio, which is roughly 1:2. That's far more elongated than many current smartphones, which makes the S8 fit neatly in the hand while offering nigh-on perfect space for watching, say, Netflix Originals series, like Stranger Things, which are shot in the same format. No black edges to worry about in such scenarios. Conversely, of course, non-2:1 content will add black bars top and bottom, which is what many apps need to do, negating some of the elongated screen's necessity. Still, if you're a boxset buff, this is the way to go. The last point of note is that the S8 - just like the Galaxy Tab S3 - is capable of HDR (high dynamic range) to not only display brighter whites, but a wider colour palette. Great in theory, but, again, there's no compatible material at the time of writing. We know that Netflix is imminent, but until then the S8 is actually ahead of the curve - in the same way as the LG G6 (which is penned as the first to get Netflix HDR). In summary: detail, brightness, deep blacks, a richness to colours, Mobile HDR Premium certification - there's little you can do to hide from the magnificence of the Galaxy S8's display. Before we get into the nitty-gritty spec detail, some further points about the S8's unlock processes, as it affects performance to some degree given it's the barrier between unlocking and using your phone. Having all but given up with the rear fingerprint scanner due to its placement, the phone also offers iris recognition and face recognition. The latter has been criticised for its ability to be fooled with a photo, but if that security issue concerns you then simply don't use the feature (we find it hit-and-miss anyway). Iris recognition is far more secure. Problem is, it struggles in low light and struggles in direct sunlight - but get it lined up and it'll unlock in a near instant, just as good as it was on the (now dead) Galaxy Note 7. Once you're into the device, you're free to do your worst with the S8's heavyweight spec load-out. In the UK that means an Exynos chip rather than Qualcomm Snapdragon 835 as you'll find in some other regions, but both are the latest 10nm chipsets and as muscular as things get right now. Pair that with 4GB RAM and the S8 is a smooth operator. The only issues we've found in operation arise from connectivity: when Wi-Fi hunting, for example, smooth-flowing animations can become temporarily stuttery, which is an inherent Android issue for some devices that we've seen, but something that shouldn't happen for a device of this ilk. That aside, however, and expect top-end games and apps to run at high settings without issue or over-heating. We've been chopping and changing between apps without issue at speed. Just because there's lots of power doesn't mean you have to use it all of the time either. To ensure the battery lasts as best as possible Samsung has implemented the aforementioned Performance Mode within the menu - accessed by swiping down the shade. It can be switched on for Game, Entertainment and High-Performance optimisation if you need that extra boost for certain tasks. It's a savvy move, because everything runs well without the mode on, ensuring all-day battery life is a norm (we've often been going to bed with 35 per cent remaining after 15-hours of use). If you do opt for all the performance then the battery will drain faster, of course, but with a quick-charge USB Type-C port or wireless charging - neither we can test, as there's no wireless charging or appropriate UK plug in the box - ensure rapid top-ups are never far away. The software is something Samsung used to deliver a little heavy-handed, but in the S8 there's a far more deft touch with the company's TouchWiz skin over the top of Android 7.1. That means a largely familiar Android experience, including full Google Assistant voice-control, heaps of customisation and good-looking near-circular icons. It's a good job that Google Assistant is on board - something that lacks from plenty of other phones outside of Google's own circle - as one of Samsung's premier features, Bixby, is hindered from the launch of the S8 in the UK. Bixby is the would-be Samsung voice-controlled assistant, but right now there's no voice, only Bixby Home which is a sort-of mixture of Upday/Flipboard highlights, serving news and personal reminders - but not really being all that necessary. So, by and large, we've ignored Bixby for the time being. But the S8's user experience hasn't left us disappointed, as the software is otherwise clean and the edge-swipe quick-access apps are really handy too. The only real downside is the menu layouts are a little odd, which has left us going around in circular navigation loops to find some settings. Data roaming is hidden behind a host of clicks, for example. The other interesting thing about Samsung's updated software is that it quietly introduces various optimisation features. Almost taking a leaf out of Huawei's EMUI book, the S8 will prompt you about apps which have been idle but are draining battery life and give you the option to force them shut. It's not as invasive or frequent as Huawei's implementation, however, so feels more user-friendly. The second notable one is Video Enhancer, which will auto-prompt when you open a compatible app - including Netflix, YouTube, BBC iPlayer and more - and offer a software-based visual enhancement designed to give a better-balanced image (it's off by default avoid unnecessary battery drain). This isn't HDR in full effect, simply a software solution to make the most of that screen. In addition to there's a heap of customisation options. From headphone tuning, to always-on display customisation, edge screen functions and the ability to push apps to run in full-screen, the software experience runs deep. There's even the option to not install Samsung bloat upon initial startup, which is a confident and user-focused approach indeed. The last major piece of the S8 puzzle is its cameras. The earlier S7 set the bar high in this regard, so while the S8 has a lot of pressure to get things right, it certainly doesn't fail to impress. Interestingly there's no dual camera gimmickry here - a la iPhone 7 Plus or Huawei P10 Plus - it's a simple rear camera and front camera operation instead. And it works perfectly well. Well, better than well: switch the camera to Pro mode via a quick swipe to raise the quick menu and it's got a super-fast autofocus system that's always looking for the most apparent subjects within the frame; tap on screen to focus and the camera can track a subject even if you recompose the shot. It's a nifty setup, plus offers controls for ISO sensitivity, shutter speed, white balance, manual focus, exposure compensation and filters. Pro camera always exists when closing the camera, however, which is a shame. Quality-wise the S8 is up there with the best of best. In bright conditions there's heaps of colour and detail, while low-light will increase the ISO sensitivity and diminish the detail - but not excessively, thanks to the f/1.7 aperture allowing lots of light in, along with optical stabilisation helping keep thing sharp. It's possible to shoot raw files if you want even fuller control in post-production, angling this camera as one for the discerning snapper. There's also been a bump in hardware around the front with a higher-resolution 8-megapixel camera. Looking to capture your best angle, the front camera now uses autofocus too, meaning selfies are generally sharper. It also means you can have more control over the focus in selfies, with the ubiquitous blurring options that come with that. The only real complaint is the addition of AI stickers - "dog face" might be fun, but that's already in Snapchat, so why repeat? - and Bixby Vision, which all add some unnecessary clutter to the app. And there's no way to remove these. Otherwise the single rear camera approach is a solid one. But as much as the S8 is the amalgamation of Samsung's good ideas, it has necessitated some poor choices too: the rear-positioned fingerprint scanner is the weakest in any flagship, by position and by responsiveness; while Bixby doesn't really warrant being a selling point just yet, as it's roughly non-existent and the dedicated button ought to be programmable. But those points become somewhat moot when considering the iris-scan unlock and the presence of Google Assistant. Add to that the excellent camera experience (which is delivered without too many gimmicks), Samsung's most battery-conscious and customisable software rework to date, and what we have here is the best Android phone of 2017. In short: the Samsung Galaxy S8 is a masterpiece; one with a few brush-strokes out of place, but a masterpiece nonetheless. Want to go super-sized? Well, the Plus model ought to be right up your street. With a 6.2-inch screen, the S8+ doesn't feel too large thanks to that near-2:1 aspect ratio screen. The larger scale means a larger battery capacity too. Oh, and a larger price point too. First out of the gate with this new 2:1 aspect ratio display with HDR was the LG G6. It might have pipped Samsung to the post in announcing its phone, but the Samsung betters the design in our view. If you want a big-screen phone without the 2:1 aspect ratio, the Pixel XL is the mac-daddy of Android phones. It's pure, enhanced Android with all of Google's latest tricks packed in to a fast, powerful device with a brilliant camera and exemplary battery life. The design isn't as exciting or eye-catching, though. If you want it all but without the Android part, the 7 Plus is your current best bet. It feels much fatter in the hand, but iPhones have long offered a consistently good experience. It's excellently built, has a great camera system, lasts more than a day per charge and offers the best apps available anywhere. The design does look dated, though.